The idea that God is interested in us as individuals is an unfamiliar concept to many, while rejection has become a fact of life. This book encourages the reader to embrace the truth of a personal God; one with whom we do not need to struggle to gain recognition, who intervenes and acts on our behalf. A God who knows our name! Each of the eight chapters contains two sections, dealing with situations of rejection. Each tells the story of an individual from the Bible narrative, explaining how God stepped in to change their situation, thus revealing how important they were to Him. The second, connecting story, tells of a present day individual in similar circumstances and how God also positively intervened in their lives. These are true stories, using carefully researched material for authenticity and accuracy. The stories are told with remarkable power and conviction. - Publisher For many people the idea that God likes us as individuals, just as we are, is often an unfamiliar concept, while rejection--by a partner, one's parents, an employer, or friends--is a fact of life.This book encourages readers to embrace the truth of a personal God with whom we do not need tostruggle to gain recognition, a God who intervenes and acts on our behalf, a God who knows our names! 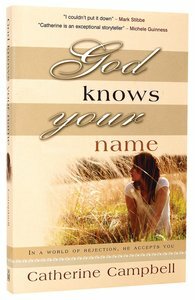 About "God Knows Your Name"
For many people the idea that God likes us as individuals, just as we are, is often an unfamiliar concept, while rejection--by a partner, one's parents, an employer, or friends--is a fact of life.This book encourages readers to embrace the truth of a personal God with whom we do not need tostruggle to gain recognition, a God who intervenes and acts on our behalf, a God who knows our names!